A custom tile Backsplash adds a touch of elegance and class to your kitchen or bathroom. A good looking tile backsplash not only adds beauty, but function as well as it protects your walls from all of the common spills and mishaps you can find within a kitchen. Oil, grease, ketchup, various sauces and splashes that usually adorn the wall of a kitchen become much easier to clean. Before making a decision on your backsplash, you want to have all of your cabinet, countertop and appliance selections finished. This way you’ll be able to choose a backsplash material or tile pattern that can compliment the rest of your kitchen. Your tile choices will be overwhelming so keep the idea simple. Lonestar Home Solutions is a full service home remodeling contractor based out of Seguin, Texas. 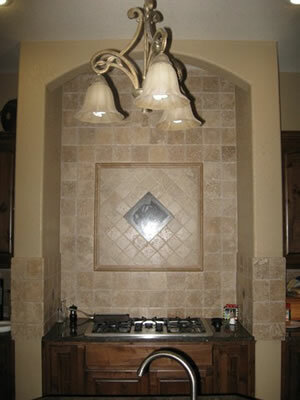 We specialize in designing and building custom tile backsplashes into residential kitchens and commercial buildings. We can add a backsplash to your kitchen, bathroom, spa, or wherever you’d like one, really. Do you have an existing backsplash in your kitchen that is old and dated and needs to be replaced? Not a problem at all! We have special tile saws and removal tools to take the old backsplash off and then we can work with you to design and install a beautiful new accent in your kitchen.